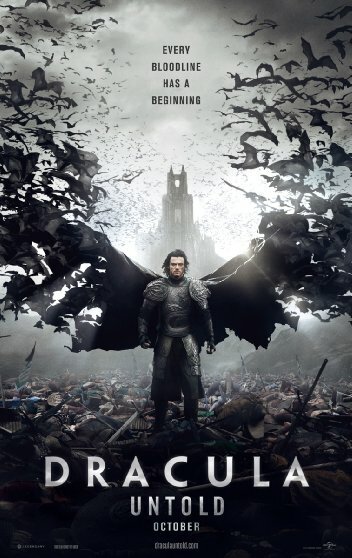 The character of Dracula remains an undying (haha) force of inspiration for any kind of medium – and Gary Shore’s Dracula Untold is the latest work surrounding the evil vampire, the monstrous nobleman, the one that his people fear to be the devil himself. In an attempt to defy other narratives and legends, though, this film tells the story of how Dracula came to be – and it’s a dramatic tale of heartbreak, sorrow, and self-sacrifice. Obviously, we all know that Vlad the Impaler was not actually a vampire, but I find the film’s premise rather fascinating: different from those dark stories completely drowned in ridiculous mythology, it actually achieves an intriguing interaction between history and myth, between reality and fiction. You cannot expect a historically accurate masterpiece here, of course; I happened to go to the movie with a Rumanian friend, who was able to point my attention to all the slight twists in favour of the story – it definitely adds a humorous element to the film experience. And yet it incorporates the overall narrative from the history books quite well with the well-known character from the numerous fictional works that we have encountered so far: even the presentation of the Ottoman Empire is supposedly surprisingly similar to Rumanian history lessons. And getting to know Dracula as a rather religious human who feels repelled by what he has had to become certainly adds a different, fresh layer of interpretation to the vampire myths: after all, is Dracula not supposed to be pure evil, and nothing else? Yes, admittedly, to everyone hurrying over to YouTube or IMDB right now: the trailer does look a little trashy indeed. I remember laughing at it when I first saw it, but I was much more intrigued and excited about it every time I saw it in the cinema. And that’s the thing with this film: it may not be the best one ever made, and the characters may not be the most original in their essence, but the film really grows with its special effects. I’d go so far as to say that it’s a movie that works best (or only?) on the big screen: the grandeur of it – the thousands of bats suddenly rushing in – probably does not compare to the experience on a small home screen. If you’re looking for something dramatic that incorporates fantasy and reality, this might be the movie for you: it definitely takes you for a fun, action-driven ride – although I do feel that an overly sappy, romanticised ending just ruins it to a large extent. If you’re able to overlook that, though, why not go for it? Vampires, after all, are quite cool. When they don’t glitter, that is.